OE/VK2JI/P – December 7th. 2015 – OE/TI-517 Hohe Salve. As the 10m/6m SOTA challenge part 2 has now started, I wanted to get out and add some six metre activator points to my score from part 1 of the challenge. Living in Germany however, I am not allowed to operate portable on 6 metres so a trip into another country is needed to make this happen. I had activated Hohe Salve over 2 years previously, and knowing it is an easy access summit (cable car to the summit and then walk 100m or so to a spot to operate from) and as of December 1st. it also gains 3 winter bonus points for the activator it was my choice. Many summits in Austria and Germany had not yet restarted their cable car services after the annual maintenance period however Hohe Salve’s Salvenbahnen were scheduled to come back into operation on December 5th. – which they did. For six metres I ordered and built a super-lightweight 2 element Yagi antenna, however during testing on the 5th. of December the fibreglass squid pole that I had mounted it on, for vswr tests in the garden, collapsed snapping the boom of the antenna. I must be considered partially to blame for this as I had decided on a very simple mountiing method for the beam – simply drilling a hole through the plastic pipe boom and dropping it over the top of the squid pole. I managed to source some replacement (thicker walled) plumbing plastic pipe from the local DIY store the next day, however decided rather to rely on the Spiderbeams Aerial-51 UL-404 off centre fed wire dipole that I would be using for 10, 20 & 40m in any case. While it wont give any gain on 50MHz it is defined as working on six meters and I wouldn’t have the guying complications needed with the beam. So I would in fact be using the usual kit that I had used on many activations before. The “two bag configuration” and not the vertical lightweight pack. Hohe Salve is located above Hopfgarten about 20 minutes drive from the German/Austrian border at Kiefersfelden/Kufstein. As you need a special sticker to drive on Austrian autobahns (at they don’t do a 1 day pass), I had to leave the German autobahn at Kiefersfelden and follow the old roads through to Hopfgarten. The journey would possibly have taken ten minutes less if I had an autobahn pass and used the autobahn right to the Wörgl turn-off but the trip from my home to the bottom station of the cable car took 1hr.45 minutes rather than the 2 hrs.15 minutes quoted by Google maps. The return journey was a different story! I was stuck almost a hour in slow moving and stopped traffic on the Munich ring road. Since the last time I was here, there appears to be a new cable car lift called the Hohe Salve lift, which come up the other side of the mountain from Söll. It would take me longer to drive to that lift than the one in Hopfgarten however if the Salvebahn were to be stopped or simply very busy for some reason, this would be another option to get to the summit. The views on the way up in the cable car were of green fields until you got to an artificial snow machine and there you had the piste. Basically the main pistes from the top to the middle station of the cable car had been prepared using cooled sprayed wather than turns into snow, so that the skiing season can start. It was not busy but there were a few families enjoying skiing on the mountain. When I got to the summit, I wanted to head to the same grassy spot that I had used previously but that (the summit and about 20m down the slope was actually covered with real snow) was roped off. I thought this was to stop the people trying to ski down in this direction and find that the piste on this side of the mountain hadn’t been created with artificial snow. About an hour later I found the real reason. The area is used by those crazy enough to leap off the mountain and use a para-glider to get down the mountain. I looked around and found a viewing platform with a handy railing to attach the antenna mast to and some benches to sit and put the gear on. Luxury – but only as long as the kids climbing rock and slide aren’t in use. On this day the kids were more interested in getting in their first ski runs of the season, so I was left pretty much alone apart from one gentleman who approached me while I was packing up, he seemed interested and left with a German language brochure about amateur radio that I take with me. Perhaps a future Ham – who knows…. I had planned the activation to start at 12:30 local time (11:30 UTC) but was in fact set up and calling a half an hour before this. I first started on six metres but then when I tried to self spot, I found I could not get Internet connectivity to work. On previous actvations in Austria I had received a message from my Telco warning me that Internet usage wouuld be expensive when roaming, now it seems you have to buy a days package and as I use a PAYG SIM card, there wasn’t enough credit on my card to buy the package. I tried spotting myself via one of the phone apps that supports spotting by SMS but could not tell if it had actually got through as for that I would need Internet to see what appeared at SOTAWatch. Then I wondered…. in some ski resorts there is WiFi available either free or chargable to a credit card and when I checked, sure enough, I could get a weak WiFi signal and once I accepted the usage terms and conditions I had Internet acess for free. Now I could see if my spots were getting through and just as important as it turned out, see who else was activating. My spots and calls on 6 metres were all in vain. Band conditions were terrible, so I tried 10 metres – still no takers. Then I saw OE7PHI/P was activating OE/SB-163 so I called him and we had an S2S contact on 20m. I asked him if he had 10m and while he had no antenna for 10m we decided to give it a try anyway and indeed the copy on 10 metres was actually better than on 20m. YAHOO – at least one contact on 10m for the challenge and an S2S at that (although it wont count for normal points as I had already had the contact on 20m, but it does count for the challenge). I put a couple more CQs out on 10 metres before returning to 20 metres and 40 metres where I managed contacts with a few chasers, so the summit was then activated. Later I tried 6 metres and 10 metres again and was surprised (and happy) to get another call on 10 metres. This was Stephan DM1LE who was activating DL/EW-022, so not only more challenge activator points but another S2S to boot! I finished up with a total of 18 contacts in about an hour, of which 6 were S2S contacts (5 of those counting for chaser/S2S points and 2 counting towards the challenge). So despite the lack of 6 metre contacts (which was the reason that I needed to travel outside of Germany to activate), the day was successful. I may head back to Hohe Salve in the new year to give it another go before the end of the challenge and while the winter bonus points are still available. The propagation on both 6 metres and 10 metres was horrible. The 10 metre contacts I managed were certainly ground wave or “line of sight”. I am so happy that I went on the day I did as two days later the webcam shows a “white-out” of the whole area! 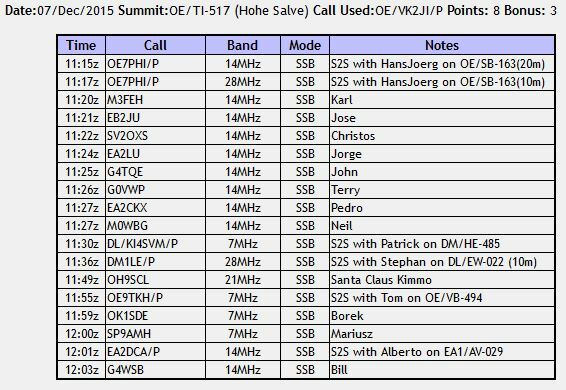 This entry was posted in SOTA and tagged Hohe Salve, OE/TI-517, SOTA by VK2JI DD5LP G8GLM. Bookmark the permalink.